The latest auction results coming in from Geneva have yet again held Ruby, as the King of Gems! The Roxburghe Rubies, a suite containing necklace & earrings set with extravagant Burmese Rubies & cushion cut diamonds has achieved a price of USD 5.77 Million which is a new record. 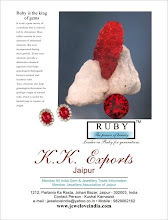 "The suite attracted extraordinary pre-sale attention at exhibitions around the world both for the quality of the rubies and the significant historical provenance, and sold for ($5.77 million) ...", commented David Bennett, Sotheby's chairman of jewelry for Europe and the Middle East. At the same auction some prominent diamonds were also auctioned. Ruby has yet again shown its prominence in the world of luxury.